In the post, The Trouble with Darwin, some of the problems with Darwin’s Theory of Evolution were. Among the issues presented were the lack of transitional fossils, the Cambrian Explosion, the incredible complexity of living things and the fact that naturalistic processes have utterly failed to explain how non-living chemicals could assemble themselves into the first living cell. Another problem with evolution mentioned in that post was the discrediting of the icons of evolution – images that have represented the proof of natural selection for more than 100 years. Lee Strobel, in his book, The Case for a Creator, listed them. These icons have been appearing in text books for over a century, unchallenged. These icons constitute a fraud of epic proportion upon students of the life sciences and really upon us all. It was shocking and it was exhilarating! In 1953 scientists Stanley Miller and Harold Urey had succeeded in creating “the building blocks” of life in a test tube. Mimicking what were believed to be the natural conditions of the early Earth’s atmosphere, and then sending an electric spark through it, Miller and Urey had formed simple amino acids. As amino acids are the “building blocks” of life, it was thought that it would be just a matter of time before scientists could themselves create living organisms and do away with the mystery and myth of life. • In the 1970s, scientists began to conclude that the Earth’s early atmosphere was nothing like the mixture of gasses used by Miller and Urey. Instead of being what scientists call a “reducing,” or hydrogen-rich environment, the Earth’s early atmosphere probably consisted of gasses released by volcanoes. Today there is a near consensus among geochemists on this point. But put those volcanic gasses in the Miller-Urey apparatus, and the experiment doesn’t work – in other words, no “building blocks” of life. What did textbook publishers do with these inconvenient facts? 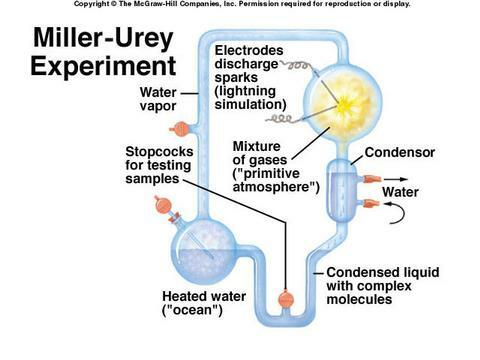 By and large, they ignore them and continue to use the Miller-Urey experiment to convince students that scientists have demonstrated an important first step in the origin of life. Most textbooks also go on to tell students that origin-of-life researchers have found a wealth of other evidence to explain how life originated spontaneously – but they don’t tell students that the researchers themselves now acknowledge that the explanation still eludes them. No one doubts, of course, that a certain amount of descent with modification occurs within species. But Darwin’s theory claims to account for the origin of new species– in fact, for every species since the first cells emerged from the primordial ooze. 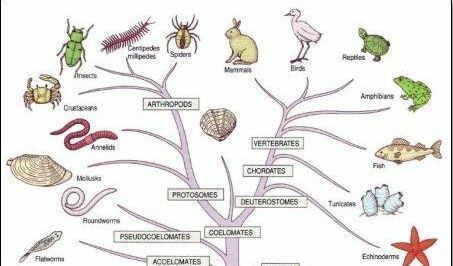 This theory does have the virtue of making a prediction: If all living things are gradually modified descendants of one or a few original forms, then the history of life should resemble a branching tree. Unfortunately, despite official pronouncements, this prediction has in some important respects turned out to be wrong. The fossil record shows the major groups of animals appearing fully formed at about the same time in a “Cambrian explosion,” rather than diverging from a common ancestor. Darwin knew this, and considered it a serious objection to his theory. But he attributed it to the imperfection of the fossil record, and he thought that future research would supply the missing ancestors. But a century and a half of continued fossil collecting has only aggravated the problem. Instead of slight differences appearing first, then greater differences emerging later, the greatest differences appear right at the start. Some fossil experts describe this as “top-down evolution,” and note that it contradicts the “bottom-up” pattern predicted by Darwin’s theory. Yet most current biology textbooks don’t even mention the Cambrian explosion, much less point out the challenge it poses for Darwinian evolution. Then came the evidence from molecular biology. Biologists in the 1970’s began testing Darwin’s branching tree pattern by comparing molecules in various species. The more similar the molecules in two different species are, the more closely related they are presumed to be. At first this approach seemed to confirm Darwin’s tree of life. But as scientists compared more and more molecules, they found that different molecules yield conflicting results. The branching-tree pattern inferred from one molecule often contradicts the pattern obtained from another. Nevertheless, biology textbooks continue to assure students that Darwin’s Tree of Life is a scientific fact overwhelmingly confirmed by evidence. Judging from the real fossil and molecular evidence, however, it is an unsubstantiated hypothesis masquerading as a fact. One of the pillars of evolutionary theory is the assertion that all animal life sprang from a common predecessor. 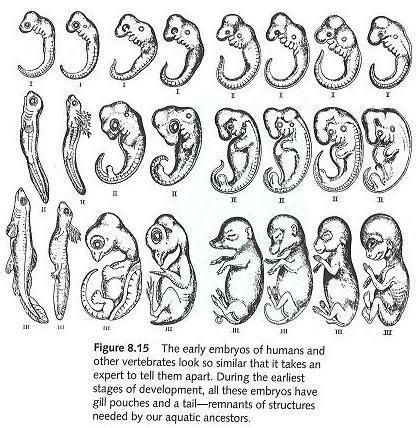 Darwin based his inference of common ancestry on the belief that the earliest stages of embryo development are the most similar. Darwin thought “by far the strongest single class of facts in favor of” his theory came from embryology. Darwin was not an embryologist, however, so he relied on the work of German biologist Ernst Haeckel, who produced drawings of embryos from various classes of vertebrates to show that they are virtually identical in their earliest stages, and become noticeably different only as they develop. It was this pattern that Darwin found so convincing. • In some cases, Haeckel used the same woodcut to print embryos that were supposedly from different classes. • In others, he doctored his drawings to make the embryos appear more alike than they really were. • Haeckel’s drawings, however, entirely omit the earliest stages, which are much different, and start at a more similar midway point. • In 1997, British embryologist Michael Richardson and an international team of experts compared Haeckel’s drawings with photographs of actual vertebrate embryos, demonstrating conclusively that the drawings misrepresent the truth. • Biologists have known for over a century that vertebrate embryos never look as similar as Haeckel drew them. So, what did science text book publishers do with this? You know the answer to that question. When Darwin’s The Origins of the Species was published in 1859, he conceded that “the most obvious and gravest objection which can be urged against my theory” was that the fossil record failed to back up his evolutionary hypothesis. Why, if species have descended from other species very gradually, do we not see transitional forms everywhere? He attributed the problem to the fossil record being incomplete – that the fossils of transitional forms had not been unearthed yet. He predicted that future discoveries would vindicate his theory. Two years later, scientists discovered the archaeoptertx in a German quarry. Darwin’s supporters were thrilled as they thought that a missing link was found between dinosaurs and birds – a connection that scientists were desperate to make. The fossil remains of a creature that is half-bird, half dinosaur would be the vindication that Darwin was hoping for. 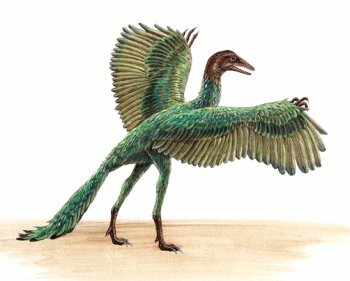 It turns out that archaeoptertx was a bird with modern feathers and not a transitional form. Like strange animals we see today, such as the duck-billed platypus, archaeoptertx was a member of a group of birds that went entirely extinct. Birds are distinct from reptiles in many important ways – their breeding system, bone structure, lungs and their distribution of weight and muscles. This was a bird. In other words, scientists can be zealous about proving Darwin to the point of dismissing key problems with their finds that would give an unbiased researcher pause before jumping to a conclusion that just isn’t there. The fact that book publishers still use these images in science text books is nothing short of a willful act of deception. The mainstream media, the academic world of textbook publishers and educators and many of those in the sciences themselves seem to be complicit in an effort to save the eroding theory at all costs. But why? If, as claimed on the PBS series, Evolution, “All known scientific evidence supports [Darwinian] evolution” as does “virtually every reputable scientist in the world”, why do the advocates of the theory feel compelled to use deceit to advance it? Science now knows that many of the pillars of Darwinian Theory are either false or misleading. Yet life sciences texts continue to present them as factual evidence of evolution. That is fraud of epic proportions. Turning from the trouble with Darwin, let’s look now at a presentation of the evidence for Intelligent Design.